Introducing herself in third person. 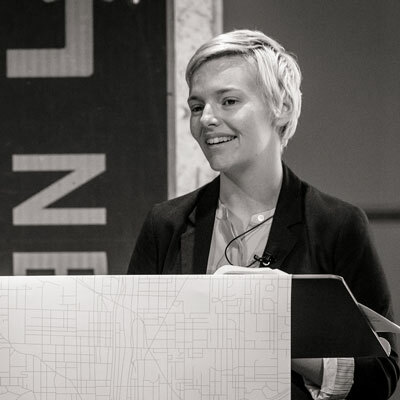 With a proven track record in establishing user-centric practices in a variety of creative environments, Abby also has a reputation for stellar information architecture work in a variety of consulting contexts. • Helped teams at Nike to improve their Business-to-Business selling process by providing information architecture consulting services. • Consulted for the team redesigning the menu system for the International House of Pancakes, resulting in a 3.6% increase in sales per store implementing the new menu. • Assisted the Understanding Group, an information architecture consultancy, to set up their information architecture process, deliverables as well as cross train their employees. • Spearheaded the creation of a user-experience planning practice within DraftFCB, a global integrated advertising agency based in Chicago. Her diverse portfolio includes work for among others: Staples, Nike, IHOP, Herman Miller, Kraft Foods, Sharpie, JELL-O, Prismacolor, Expo Markers, Valspar, KMART, Taco Bell, KFC, State Farm and The United States Postal Service, BlueCross BlueShield, JSTOR, Fidelity Investments, Bank of America, The Hartford Insurance. Abby prides herself on being an active organizer and mentor within the design community. She holds credit for inventing World Information Architecture Day. World IA Day 2014 served 24 locations and more then 2500 attendees globally. Abby was recently elected as the President of the Information Architecture Institute. Abby teaches at Parsons the New School, The School of Visual Arts, General Assembly and Hyper Island. She has guest lectured for NYU, Miami Ad School and the University of Michigan School of Information. She has additionally appeared as a speaker at Interaction12 Dublin, IXDA NYC Redux12, Wharton Web Conference 12, Search Love 2013 (Boston and London) World IA Day 2013 NYC and World IA Day 2014 Ann Arbor, Business Insider NYC Startup Conference 2013 and Midwest UX 2011 & 2013. Abby holds a dual degree in Graphic Design and Multimedia from Northeastern University where she was pretty sure she was going to be a typographer or an art history professor. During her time in art school she was known for her installation art, love of Paul Rand, failed dance punk band with matching flash animations and helpful hand as a teaching assistant in typography and class note taker in art history.